Our contributor, Jeremy Sicile-Kira, is the focus of this issue of the eBulletin. 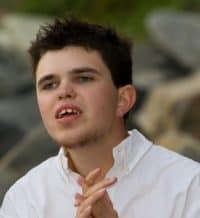 Jeremy received a grant from the Autism Research Institute this year to document his experiences with his new in-home support staff, JameyLee Nuss and Matthew Murphy, while they participated in the AGI Online Residential/Daily Living Course. Jeremy shares his perspectives regarding direct support and his long-term plan to live in his own home here. I want friends. Justly, I really have a hard time making friends. I nicely need to type out everything I want to say or point to letters and that can take a while. Justly, I need support staff to help me find places and situations to meet new people and who can help me to make and have friends. Support staff has to help me talk to people using my voice output technology. It is greatly important for staff to support me in writing answers and communicating with others, and not to answer for me. Helping me do that is nice but also necessary for me to have relationships with others besides my support staff. I need to be given opportunity to use my voice output technology on my iPad. I get less opportunity to interact with people now that I’m not in school. Just using my iPad whenever possible gives me a voice. Support staff is nice to give me the opportunity to order in restaurants with my iPad and not just my letter board. Nicely, the voice output app on my iPad is my preferred communication method while outside of my house. Nicely, staff needs to have an understanding of my real life goals. Having support staff who are justly aware of my short term and long-term goals is important. Just having everyone on the same page nicely makes a team run smoothly. I think having team meetings really helps remind everyone on the team of my goals. Having short-term goals followed through on is a big deal and very important to me. It truly makes me happy just finishing something I put my great mind to. Frankly, it also makes me happy knowing that my great team is following through on what is decided is important to my daily life. Nicely, every team member should have seen my Individual Support Plan (ISP) when they start working with me and we should all go over it frankly at every team meeting. Justly having the opportunity to give my input helps me have better days. For example, nicely every morning when the schedule for the day is made I have the opportunity to say what I want to do that day and in what order. Greatly, it is just a good way to start the day. Greatly, routine is important but so is having fun. (See JameyLee Nuss’ article about Jeremy’s daily routine). Greatly, support staff needs to be trained on how to be a communication partner, and in inclusion. Justly they need to know how to help me in group situations. It is not easy when you need a device to communicate and staff must feel comfortable in redirecting interactions to me. Also, they need to know how to help others feel comfortable in communicating with me. Person-Centered Planning and self-advocacy are important to include in every day life for someone like me. Truly, my life has meaning because of these two concepts. Greatly, I hope all people are given the opportunity to learn them. Having no plan gives me anxiety because I don’t know what to expect. Nicely, I need to know what’s next so I can greatly get my body ready. Being in certain supermarkets and coffee shops need different preparations greatly than going to the beach. For example, I need to kindly prepare by talking through the trip so that I can prepare for the different sensory stimuli I might encounter. By knowing where I am going and who is supporting me, I can make a plan of action in my head. This greatly reduces my anxiety. Greatly, new things are hard because I don’t know what to expect. New places have different lights and noises. Just how my body is doing is dependent on the environment. Greatly, it can be different just also depending on whom I’m with. If I just am going somewhere new for fun, usually it is easier. For example, going camping with my support person Ted was not as stressful as it would be if I were with different people or not on vacation. Just when kindly in new places, it is hard to deal with all the new things. Bright lights are hard because really they hurt. Loud noises are difficult greatly because I can’t block any of them out. When a place smells, I really kindly want to leave it. It is hard for me to block anything so I smell and just hear it all. Having new staff can cause anxiety. New staff is justly not as truly dependable when we are out and about. They are greatly not as comfortable in public supporting me as truly the older staff is. We need time to get used to each other. When staff is greatly uncomfortable, I can feel the anxiety and it just makes me anxious. The thought of moving out and being in my own place gives me anxiety because I have greatly never been on my own. Justly, being away from mom makes me anxious because I have been dependent on her and my dad for my whole life. Greatly, having new staff at a new house scares me a little bit. Moving to a new neighborhood means learning about the new neighborhood. Justly, I am very nervous but excited to move out. Jeremy Sicile-Kira is a writer and painter. He serves as a Young Leader of the Autistic Global Initiative. To learn more about Jeremy, visit www.jeremysvision.com.